Wine coolers aren’t just for the sommeliers of the world. Even casual wine enthusiasts can find a lot to like in owning a wine fridge that’s specifically dedicated to the task of keeping your wines fresh and tasty. If you like to drink wine, there’s a pretty good chance that at least one of the benefits that a wine cooler provides will appeal to you. The most obvious benefit of a wine refrigerator is that it keeps your wine cool, so your bottles are always at the perfect temperature for tasting or serving. You never have to make a special point to throw your wine in the refrigerator in advance or quickly attempt to chill the bottle, which tends to make the bottle too cold anyway. It’s an organized place to keep all those bottles so they’re not crowding your kitchen or taking up extra space in your refrigerator. Make it easier to take advantage of deals. You can find a lot of wine clubs or stores that offer deals for buying wines in larger quantities. For those who like wine enough to want multiple bottles around, buying a dozen or a case at a time can mean big savings in the long term. Can open the doors to collecting better wine. You don’t ever want to miss the opportunity to buy a great bottle because you lack the space for it or don’t want to worry about it spoiling due to the temperature in your home. 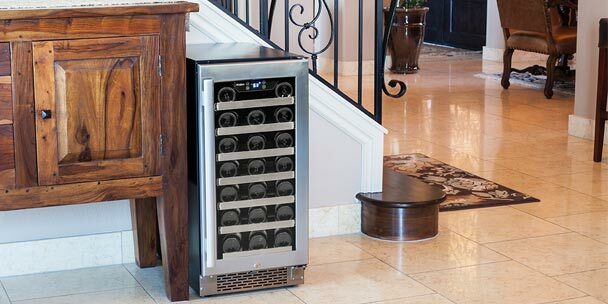 Buying a wine refrigerator is one of the first steps to becoming a collector of fine wines. Keeps your wine fresher, longer. Wine can be sensitive to temperature changes. If you live in a home that gets really hot or cold, your wine is especially at risk of losing its good flavor. Even if you live in a home that you keep at a pretty comfortable temperature, a wine cooler will keep the wine fresh and well maintained for longer. A wine cooler can also be beneficial for nice oils and vinegars, or be helpful for storage of other beverages you can’t fit into your regular fridge. If any of that sounds good to you, the next step is to figure out what type of wine refrigerator to look for. 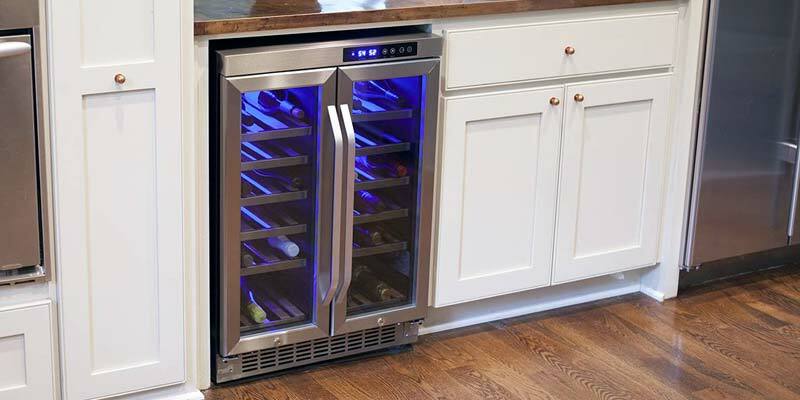 Should I get a dual-zone wine cooler or a single temperature one? Most people prefer drinking white wines chilled and red wines closer to room temperature. The ideal temperature for consuming each type of wine is different, which can complicate figuring out what temperature to keep your wine cooler at. 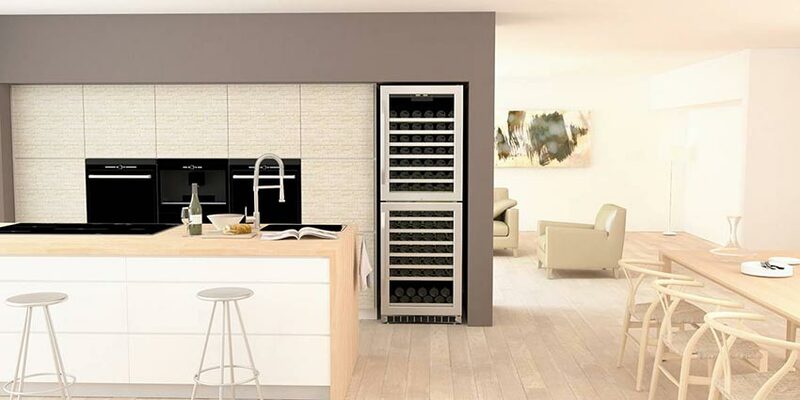 Wine lovers that mostly stick to either red or white wines should have no issue going with a single zone wine fridge, but for the many wine enthusiasts that like both, a dual zone wine cooler allows you to keep both types of wine at the ideal temperature. As you’d expect, dual zone wine refrigerators will typically cost more than single zone ones. If you find the cost of a dual zone model prohibitive, you can store both types in one wine cooler. Experts actually recommend that both red and whites should be stored in the same temperature range (about 55°), even if drinkers prefer them to be served at different ones. So from a storage perspective, single zone models make perfect sense. Dual zone models mostly come in handy for keeping your wines ready to serve. Should I purchase a thermoelectric wine fridge or go with a more traditional compressor model? The big selling point for thermoelectric wine coolers is that they’re quiet. Compressor models use the same technology that traditional refrigerators do, so you can expect a similar humming sound from them. Thermoelectric models use a different technology that eliminates the humming sound, uses less electricity than compressor fridges, and causes less vibration. But there’s a trade off: thermoelectric wine fridges can’t get as cold as compressors, especially in homes that get very hot, so they may not meet your needs. You care a lot about how loud your appliances are. Energy savings are important to you. You only need a relatively small wine cooler. Your home stays at a fairly consistent temperature. You want something effective, and the noise level doesn’t bother you. You’re interested in a high-capacity model. The temperature of your home does not stay consistent. We came across a number of reviews of thermoelectric models that made it clear the buyer didn’t understand the temperature limitations. 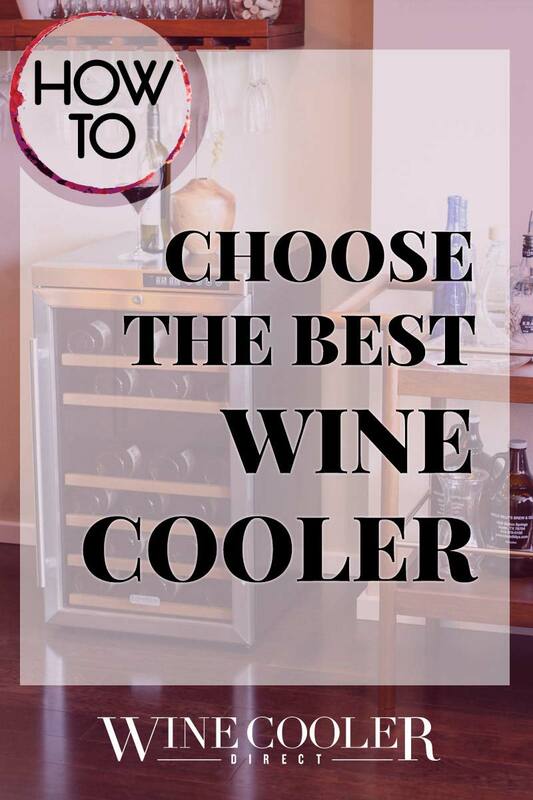 Make sure you know going in what to expect and only go with a thermoelectric wine cooler if your home stays at a consistent enough temperature to be suitable for it. Do I want a freestanding wine cooler or should I get one built into my home? 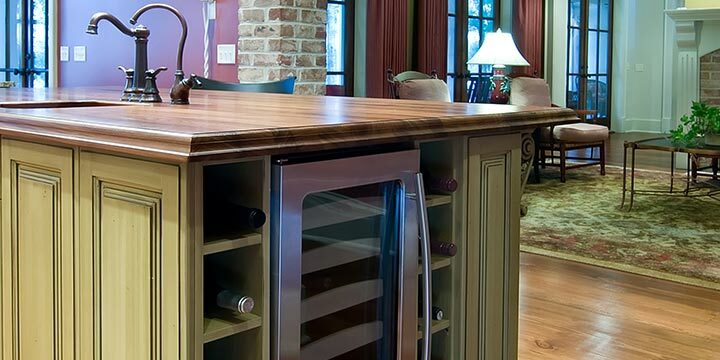 For most consumers, if you’re not in the process of building a home or going through a remodel, a freestanding wine cooler will make the most sense for you. You can put it anywhere where there’s space and an outlet for it without worrying about complicated installation. A built-in wine cooler, as the name suggests, will need to be professionally installed. A built-in wine cooler blends in seamlessly with the space it’s in and doesn’t require extra floor or counter space, so for homeowners that appreciate a clean look, the installation costs are worth it. You will be limited in the size you can choose if you go with a built-in model, since it will have to fit perfectly in the space available. You also have to be careful to choose a wine cooler that is specifically designed to be built in. If you try to install a freestanding wine cooler in the space for a built-in one, it will overheat. 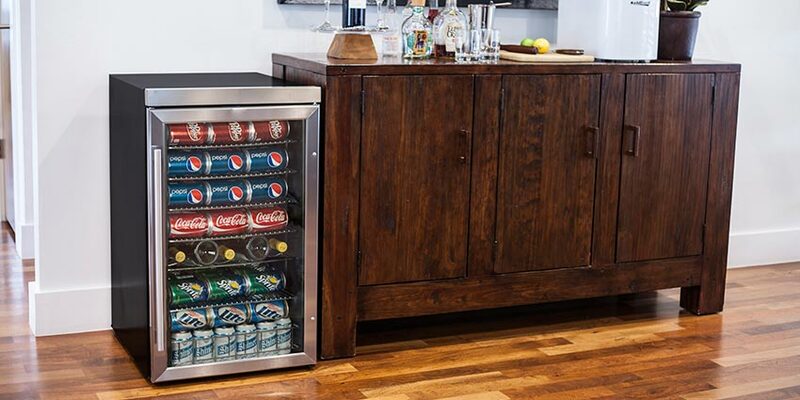 There’s a lot to consider in honing in on the best wine cooler for your needs. These are some of the top factors to keep in mind and features to look for in your search. Where are you going to put your wine cooler? You can find wine fridges that come in a lot of different sizes, but every one of them will take up enough space that you need to make sure you have a big enough spot in mind for it in advance. Of course, if you’ve been trying to find spots to store your wine without a wine cooler, the fridge you purchase could end up saving you space by giving you one organized spot to keep it all. Some consumers prefer to go with a built-in wine cooler since it gets more seamlessly tucked into the kitchen area than freestanding models. You may end up sacrificing some cabinet space for it, depending on the design of your kitchen, and you will need to pay more for the fridge itself and in installation costs if you go this route. If you’re already planning a kitchen remodel, it’s a good time to consider the addition. As you’d expect, larger wine coolers that hold more bottles will cost you more than smaller models. 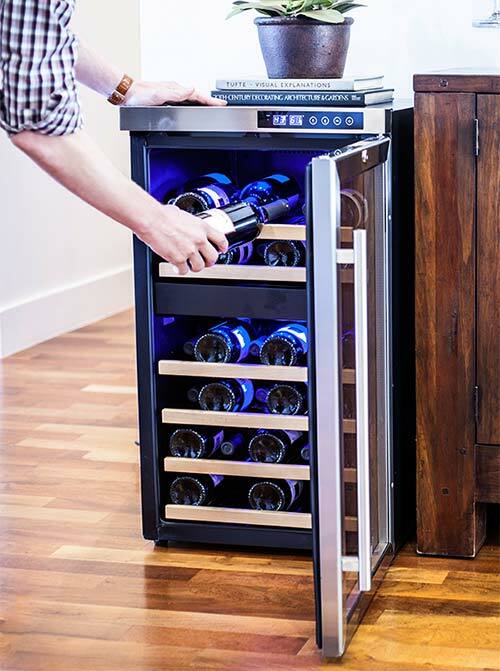 Getting something with more advanced technology, like a dual-zone wine cooler, will also add to the cost (but also to the functionality, which may be a worthy trade off for your needs). Smaller freestanding models will usually set you back $100-$300, with built-in models adding a couple hundred on top of that before installation costs. Larger models with advanced features can easily get over $1,000. 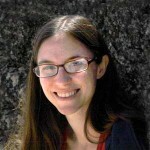 You should keep in mind related costs like shipping and energy use. Wine coolers are heavy, so you may end up paying a pretty hefty amount for delivery unless you go with a vendor that offers free shipping. The best choice for long-term savings on energy costs is a thermoelectric model, but if you live in a home without A/C or central heat, they won’t work effectively enough. For all the good electricity has brought us, it’s also filled our home with loud appliances. Some people can easily tune out all the humming and other noise pollution from common household items; others are driven crazy by it. Most wine fridges will make noise similar to what your kitchen fridge makes–they use the same technology, after all. If it’s important to you to find something quieter, you should turn to a thermoelectric model. But, as previously mentioned, they aren’t an effective choice for everyone. If you want a quiet wine cooler, but know a thermoelectric one doesn’t make sense for you where you live, then check out the reviews for the different models you consider to see what people say about the noise. Many consumers are sensitive to noise, so you can expect to see complaints for models that are especially loud and positive comments for those that work quietly. Anything that will be taking up valuable real estate in your home should look nice. You can find many wine coolers in sleek styles that will fit right into a modern kitchen and many have nice LED lighting features that both light your wine without causing any damage and look pretty cool. If aesthetics are an important consideration for you, take some time to browse and consider your options. You’ll find you have a lot of stylistic choices. Humidity control is an important feature if you intend to use your cooler for long-term storage. If you expect to drink most of the wine you purchase within 6 months or so, it’s probably unnecessary. But if you want to age your wine and drink it further down the line, then you want the conditions to be just right for it to age well and humidity control is an important factor in that. UV light can harm wine over time, so many wine coolers are tinted and only use lights that don’t emit UV. Tinted doors that reduce exposure to UV rays are always a smart choice, but if your wine cooler will be located anywhere that it will be exposed to sun, you should make a special point to get one with UV protection. A digital thermostat makes it easy to check that the temperature of your cooler is where you want it, and change it as needed. For a specialty product, you may be surprised at just how many brands are competing in the wine cooler market. Knowing the reputation of the brand you choose before buying can help ensure you go with a wine fridge that’s durable and works well. To help provide you a shortcut to gaining an idea of what to expect from different brands, we looked at the consumer reviews of different wine coolers offered by each to see what the typical customer experience with each brand is. Avallon makes sleek looking built-in wine coolers in a number of different sizes that earn solid reviews from consumers. 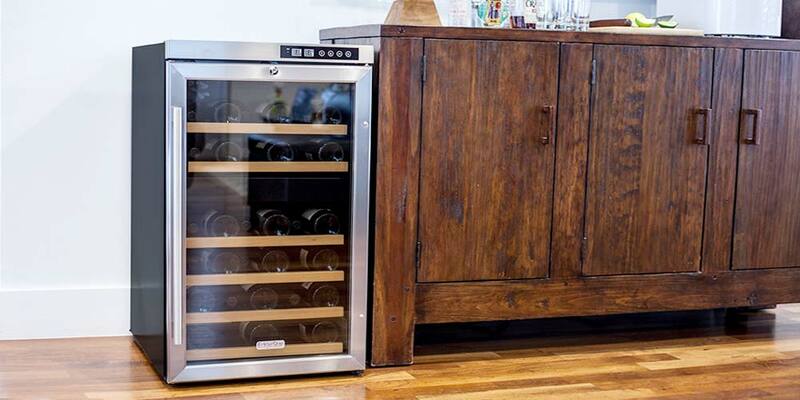 Their wine refrigerators get points for being quiet, functional, and beautiful. Avanti sells a wide range of affordable freestanding wine coolers with predominantly positive reviews. Customers comment on the great price, how well the units function and a few stated that they last a long time before needing replacement. Some models get extra praise for having space to fit an open bottle standing upright. The most common complaints we encountered are that thermoelectric models don’t get as cold as some consumers wanted (which is typical of the technology) and that some models don’t fit certain types of bottles well without removing shelves (bottles of bubbly, in particular). If you aim to store a lot of champagne, expect the capacity to be a bit lower than advertised and make sure you’re clear on whether the model you’re ordering is thermoelectric or compressor. Otherwise, their fridges seem to please. 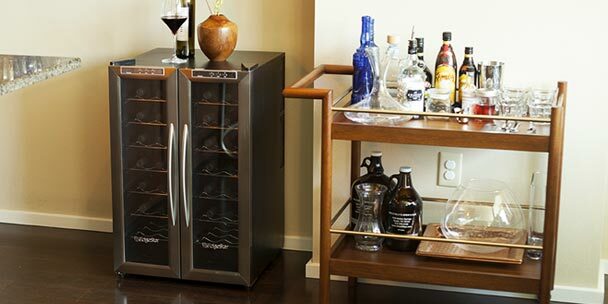 Danby has a wide range of wine fridges that includes both freestanding and built-in models. Their units get almost entirely positive reviews. We saw some complaints about noise, but other reviews that praised how quiet their wine coolers are (sometimes amongst reviews for the same model). EdgeStar has a line of wine coolers in different sizes and types. Most of their wine refrigerators get great reviews. Consumers say they look good, work well, are easy to install, and that they like the value for the price. A couple of models got complaints about durability issues, so check the reviews on any particular model before you buy. We also saw some mentions that wine coolers hold fewer bottles than advertised, which seems to be common for many wine fridges. In general though, the feedback is positive. 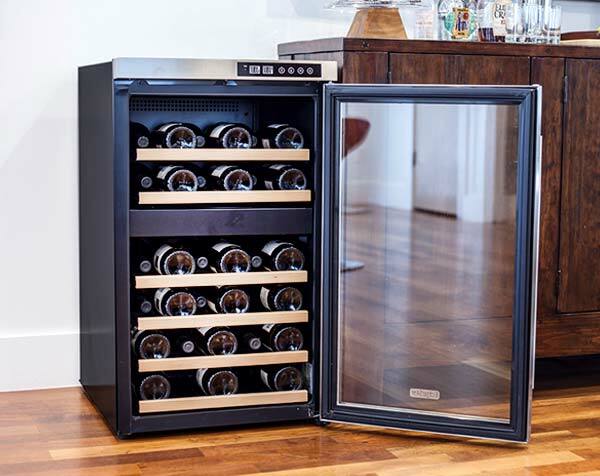 Eurocave makes high-end wine coolers with especially large capacities. Reviews are pretty mixed and those that have a negative experience are more disappointed by the problems considering the cost. Reviews suggest that if you get a model that works well, you can count on it working well for a long time, but if you get one with problems you may struggle with customer service and replacement parts. Frigidaire is a familiar name in refrigerators that makes a few wine coolers that receive mixed reviews. Most consumers are happy with their purchases, but a few complain about the fridges not fitting as many bottles as they’d like (a common complaint across brands). Koldfront sells affordable wine coolers that consumers are generally pretty happy with. They praise their units for being quiet, working effectively, and being a good deal. We saw a few complaints about durability with some models, so check on the reviews for the particular fridge you are considering buying. Overall, the majority of reviews we came across were from happy customers. Koolatron makes wine coolers that get mixed reviews from customers. Some love their purchases and say they work great, others complain about durability issues. Some models seem to fare better than others on the durability front, so take some time to look over reviews and see what consumers say about the model you’re interested in if you choose to go with a Koolatron. Magic Chef makes both wine coolers and combination wine and beverage coolers that receive fairly mixed reviews from customers. The reviewers that love their Magic Chef units say they work great and last a long time, while others complain of parts breaking quickly. On the whole, we found more positive reviews than negative. Summit is another brand with wine coolers that have mixed reviews. On the whole, their reviews lean more toward the positive and those that are happy with their wine coolers are very happy (mostly four and five-star ratings), but we also saw some complaints about coolers not lasting a long time or being loud. We didn’t find a whole lot of reviews for U-Line’s wine coolers, but the ones we found were uniformly positive. Reviewers like the design, are happy with the amount of storage provided, and say their coolers work well. Vinotemp’s wine coolers have pretty mixed reviews. We found many instances of people praising their fridges for looking great, working well, and being efficient, but found a few complaints about them breaking down within a year or two. Their units are affordable, so many reviewers were happy with the value for the amount spent. If you love wine, a wine cooler can be a worthy investment–even if you never intend to amass a huge collection of expensive bottles. 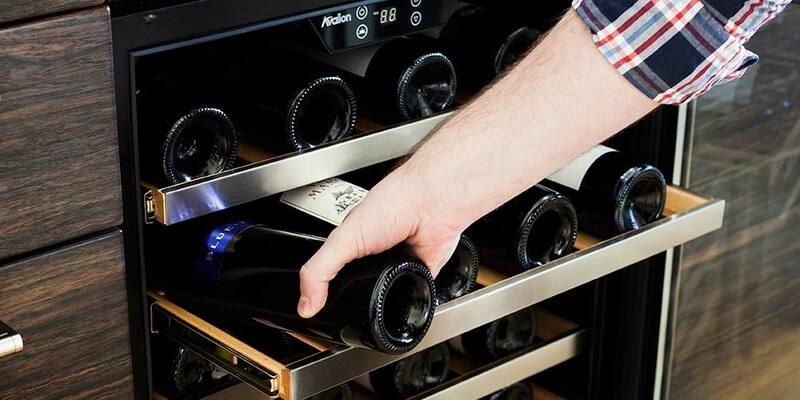 Whether your goal is to store your bottles for peak freshness or always have them accessible at the perfect temperature when you’re ready to open them, the right wine cooler can pay off. looking for a storage unit to use as a cellar to hold wine , mostly Bordeaux, which needs 5 years to mature . house is in south carolina and unit has to go in garage any ideas? Some of our wine comes in 1.5 liter bottles. Is there a cooler that can accommodate 1.5 liter bottles? Did you ever find one that works for 1.5 L bottles? That’s what I’m looking for, also! We have had two wine coolers in the last 3 years, both were thermoelectric, from what I have learned they do not last, I al looking for a compressor style. We are looking for a wine cabinet with a cherry wood or similar wood casing for our formal dining room. The dimensions are approx. 3 ft tall, 3 to 4 ft wide and 2 to 2.5 ft deep. Maybe a standard dual zone unit fitted into an armoir could be a possibility. Do you have such a unit that would meet our requirements ?? ?